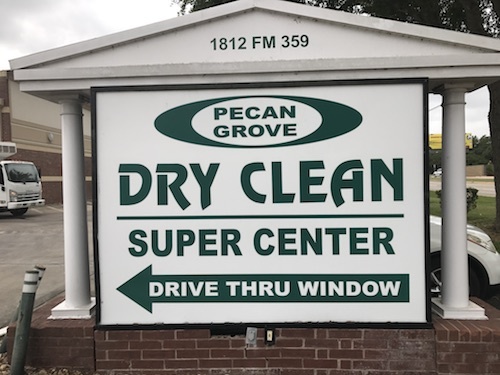 Dry Clean Super Center in Pecan Grove is a family owned and operated dry cleaners. We provide superior dry cleaning and laundry services to Richmond, Texas. Located in Pecan Grove, we service all the surrounding neighborhoods with unequalled customer service. Your satisfaction is guaranteed as our focus is to provide only the highest quality services. Whether you are simply having a button replaced or having a priceless wedding gown preserved (heirlooming), the same hight level of care is given to all of our work. We provide dry cleaning, laundry service, expert alterations, boot & shoe repair and heirlooming to our customers in Fort Bend County. If you live in Texana Plantation, Westcreek, Estates of Brazoswood, Plantation Meadows, River’s Edge, Plantation Place, River Forest or The Greens, we are close to you. We are located at 1812 FM 359 Rd, Richmond, TX 77406 – CLICK HERE to see map. Our drive-through service allows you the comfort of remaining in your vehicle while we service your drop-off or pick-up needs. Families with small children really appreciate this service!